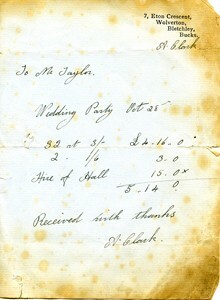 Receipt from A. Clark to Mr. Taylor for the hire of the hall for the wedding party. A total of £5.14.0 was received. The receipt is on a piece of blue paper folded in half.